The design revolution started more than 90 years ago in Thuringia, Germany. In 1919 Walter Gropius founded the most important and influential design school of the twentieth century in Weimar: "Staatliches Bauhaus." The Bauhaus existed for just fourteen years, but in its short time it has produced numerous influential designers and designs that continue to shape design today. For many artists, architects and designers, Bauhaus design was an ideology, a conviction, not just art or architectural theory. 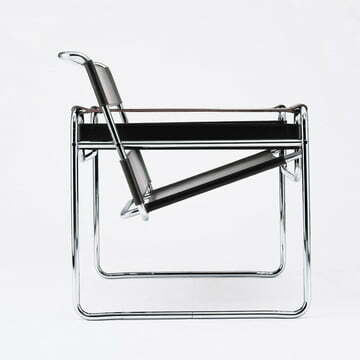 Experimenting with new materials and forms brought with it a new philosophy that led to revolutionary products like the first mass-produced cantilever chair by Marcel Breuer. In order to implement their avant-garde ideas, the followers of Bauhaus took many difficulties: in 1925, the school moved to Dessau - a city that at that time was considered more liberal and allowed greater artistic freedom than Weimar before one last move to Berlin in 1932, where the end of the revolutionary movement unfortunately could not be prevented. In the Third Reich many designs of the Bauhaus designers were considered degenerate. Especially the left-leaning lifestyle of the Bauhaus fans was not welcome. In Bauhaus designs, women wore pants - an absurdity in the reactionary world view of the NSDAP. Due to the external circumstances, many Bauhaus followers decided to leave Germany after the seizure of power by the Nazis in 1933. What was considered to be the death sentence of the German Bauhaus movement was also the starting point for a new design worldwide: Prominent Bauhaus protagonists such as Josef Albers, Walter Gropius, László Moholy-Nagy and Ludwig Mies van der Rohe emigrated to the USA, where a new architectural, but also product and communication design direction developed, following the example of the German Bauhaus doctrine. The history of the Bauhaus makes it clear that the enthusiasm for a new, better, more functional design could not simply be turned off. The will to build "furniture for everyone" still works: many Bauhaus inventions, such as the fitted kitchen, are still found worldwide today. Many things that seem commonplace to us today go back to the Bauhaus movement. But not only the basic ideas and concepts are loved by many people. Many products from the Bauhaus era continue to enjoy popularity up until today. 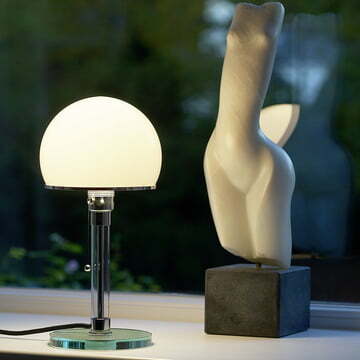 For example, the Wagenfeld Lamp has become the international symbol of good Bauhaus design. Due to the simple, universal design, which focused on the needs of the human being, these objects are up to date and timeless just under a century after their creation. ClassiCon ClassiCon produces and exclusively sells the Eileen Gray collection. Since its founding in 1990, ClassiCon advocates and presents, in addition to classical and coeval design, works by Konstantin Grcic from Munich. Fürstenberg Porcelain The porcelain manufacturer Fürstenberg looks back on a long past full of tradition. Its history begins with a letter dated 11 January 1747 and an order by Duke Carl I of Braunschweig. Junghans Inventiveness and the continuous pursuit of precision form the basis for the Junghans company success story since the company was founded in 1861. Kaiser idell Kaiser idell, the Bauhaus lamp 6631 Luxus by Christoph Dell, also called the "commissioner lamp." Knoll International From the company founded in 1938, Knoll has evolved into a global manufacturer of office furniture, committed to excellent design. Tecnolumen Tecnolumen: producer of the world-famous Wilhelm Wagenfeld lamp WA24, also known as the Bauhaus lamp. Thonet The German manufacturer Thonet is one of the oldest family-operated furniture manufacturers in the world. The manufacturer is known for its ground-breaking furniture, bentwood and steel, representing a milestone in industrial design. Josef Albers Josef Albers was born in 1888 in Bottrop. With the closure of the Bauhaus under Nazi pressure in 1933, Albers immigrated to the United States. As teacher and artist, Albers pioneering for a whole generation of Ameriican artists. Ludwig Hirschfeld-Mack Ludwig Hirschfeld-Mack was born in 1893 and died 1968. He belonged to the most innovative artists of the Bauhaus. He was involved in the graphic-editioons as an assistant of the print shop of the Weimar Art School. Ludwig Mies van der Rohe Ludwig Mies van der Rohe was born in Aachen on 27th March 1886 under the civil name Maria Ludwig Michael Mies. Not until around 1921 he appears under the name "Mies van der Rohe". Marianne Brandt Marianne Brandt was born in Chemnitz in 1893. She especially succeeded as metal designer, but also worked as a sculptor and painter. Max Bill Max Bill was born on the 22nd December 1908 in the Swiss Winterthur. Max Bill finished an apprenticeship as a silversmith at the arts school in Zurich from 1924 to 1927. Walter Gropius Walter Gropius wasn’t only an important architect: as founder of the Bauhhaus, Gropius’ work is still embossing for his followers.